The new Dyson Pure Hot + Cool air purifier comes equipped with HEPA and Carbon filters that enable air purification. It also features heating element to project warm air in a room. Dyson Pure Hot + Cool air purifier launched in India. The device is an air purifier with a built-in heating element to project warm air. The air purifier also features an LCD display on the front. 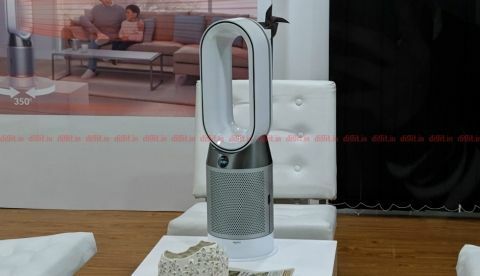 Dyson has launched its latest air purifier in India, the Dyson Pure Hot + Cool. The new device builds upon the company’s previous offerings, the Dyson Pure Cool and the Pure Cool Link, albeit with some new features thrown into the mix. It is an air purifier but as the name suggests, it can circulate both hot or cool air, depending on what it is set at. The Dyson Pure Hot + Cool air purifier sports the same tower design that we have seen in the company’s other air purifiers. 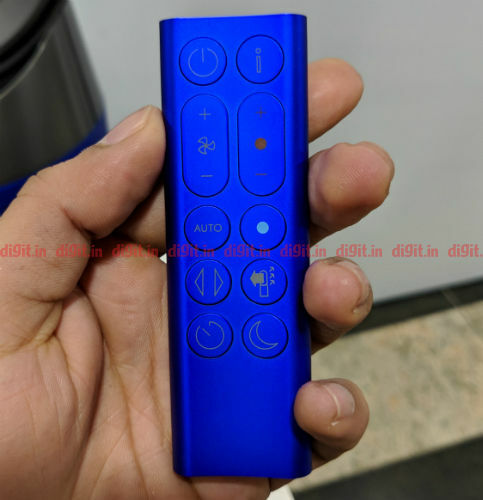 It also comes equipped with an LCD display on the front, which shows various metrics related to air quality like the Air Quality Index (AQI), PM2.5, PM10 levels and more. The new air purifier is priced at Rs 52,900, comes in White/Silver colour and Iron/Blue colour models and can be bought from offline and online channels. The new Dyson Pure Hot + Cool sports three sensors that pick up the amount of pollutants in the air. One of the sensors measures particulate matter in the air like PM2.5 and PM10 particles, another one analyses Volatile Organic Compounds (VOCs) like formaldehyde, benzene and airborne Nitrogen compounds, while the third one measures relative humidity and temperature. The air purifier also offers an auto mode that can be switched on so that using the sensor, the device automatically adjusts the speed of the air purifier and the hot/cool air flow. The device can also be operated via a remote that enables standard functions like switching the device on and off, scheduling, oscillation, fan speed, and more. While there is a provision to vary the temperature on the device between 1-37 degrees Celsius, it doesn’t actually spew air at the set temperature. The air purifier measures the ambient temperature and expels cold or hot air till the overall temperature in a room is at the set level. Additionally, the air purifier has a thermostat heat control and the heating option switches to standby mode and switches back on when required. The new device is said to come with 60 percent additional HEPA media into a HEPA filter and the carbon filter apparently features thrice the amount of activated carbon that Dyson says can absorb gases, odours, domestic fumes and VOCs. The Dyson Pure Hot + Cool air purifier also connects with the Dyson app that enables IoT features for the device. These features include remotely operating the device, along with scheduling, display of particulate levels and more. The replacement filters for the new device cost Rs 5000 and one will need to change the filters in 6-8 months, depending upon the pollution in their area. Like all Dyson products, the new air purifier also comes with a two-year warranty and the company is also offering a zero cost EMI option for buyers on the product.